This track is a pretty short one and it only plays whenever the Antarans decide to directly talk to you (and if the Antarans are talking to you, you're in for a world of hurt). I've been playing Master of Orion II recently and find these guys a real pain in the backside - I've lost two games so far thanks to them and I'm playing on Tutor difficulty (the easiest difficulty in the game). Whiskey Tango Foxtrot? Anyway, after reading some forum posts, apparently building planetary defenses are actually quite useful in stopping Antaran raids (at least the early ones) so I'll have to do that more - I'm getting sick of losing colonies to them! Check out the artwork in the screenshot though - I think it's pretty damn good. 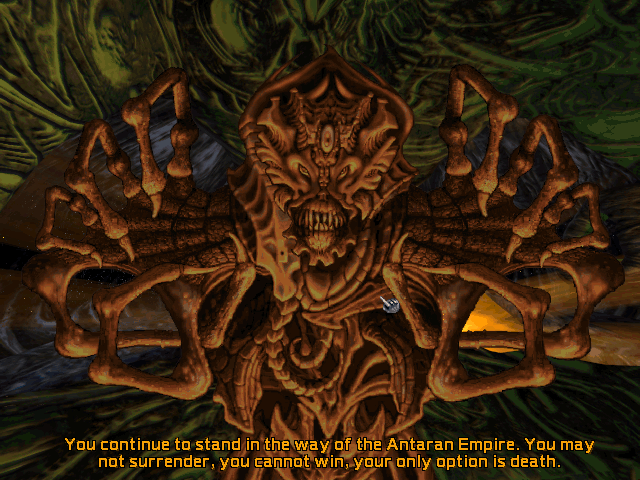 Those Antarans definitely look creepy enough, even creepier than the newer versions in Master of Orion: Conquer the Stars.